Throughout his 35 years in the United States Congress, U.S. Senator Daniel K. Akaka brought many of Hawaii’s most important issues to the national forefront. Although many remember him as a champion of the Native Hawaiian community, he was also a strong advocate for many other constituencies, including students and educators, service members and veterans, and the elderly. Equally important, he brought the Aloha spirit to Washington, D.C., which helped him build friendships and relationships across the aisle. As a civilian worker in the U.S. Army Corps of Engineers, on active duty in the U.S. Army, or as an educator in Hawaii’s schools, he always put people first. 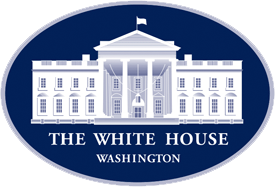 It is no surprise that the people of Hawaii recognized this admirable quality and elected him time and time again into office to represent them in Congress, first in the U.S. House of Representatives and then in the U.S. Senate. Beyond his legislative accomplishments, Senator Akaka’s humble upbringing reminds all keiki in Hawaii that anything is possible. His career as the first Native Hawaiian to serve in the U.S. Senate is not just historic, but encouraging to everyone in Hawaii and is an inspiration to all who call Hawaii home. Senator Akaka is also to be celebrated as a shining example of a family man. Together with his wife, Auntie Millie, they raised five children, Millannie, Daniel Jr., Gerard, Alan, and Nicholas. He was the cornerstone of a large family that now includes many grandchildren and great-grandchildren and he will be sorely missed by all. 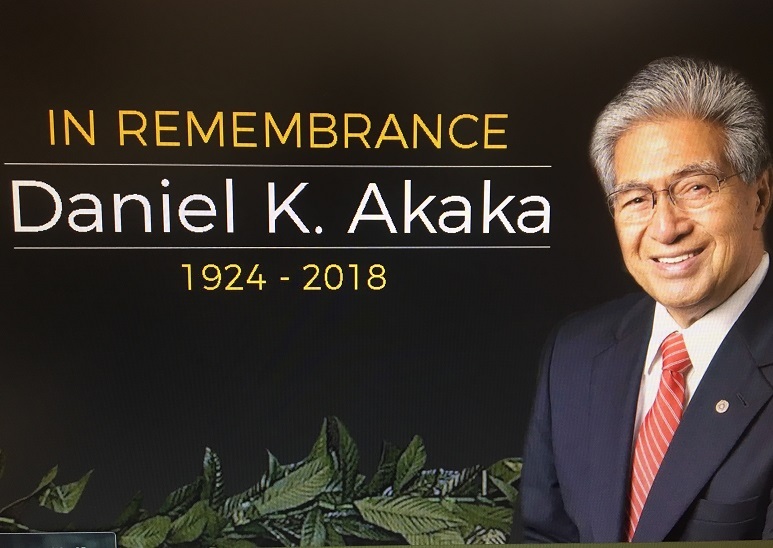 Senator Daniel Akaka lay in state at the Hawaii State Capitol from Friday, May 18, 2018 to Saturday, May 19, 2018. 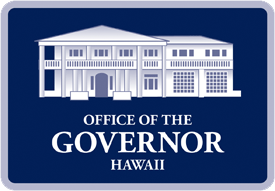 A prayer service was conducted on May 18th where Kahu Kimo Merseberg presided and Governor Ige, Lt. Governor Chin, Governor Ariyoshi, Governor Waihee, Governor Cayetano, Governor Abercrombie, Mayor Caldwell, Mayor Carvahlo, and Managing Director Will Okabe spoke of the Senator’s kindness, generosity, and loving nature and how he impacted their lives and the lives of countless others throughout the State and in Congress. 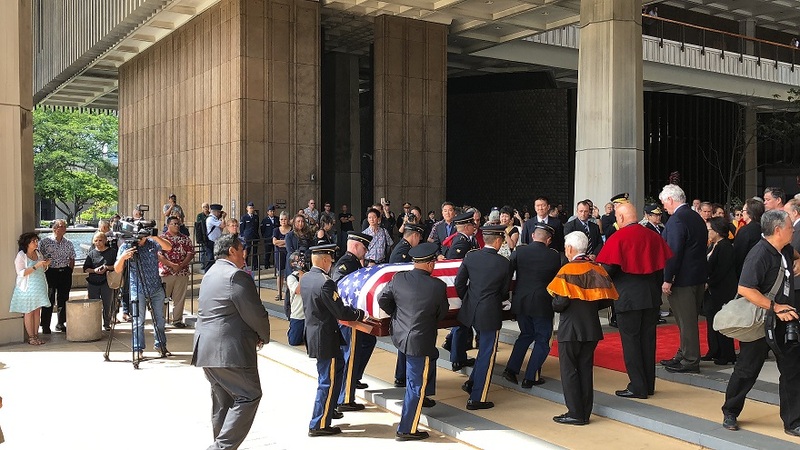 Funeral services were held on Saturday, May 19th at Kawaihaʻo Church where family, friends and members of the public gathered to pay their respects and give their last goodbyes to Senator Akaka. 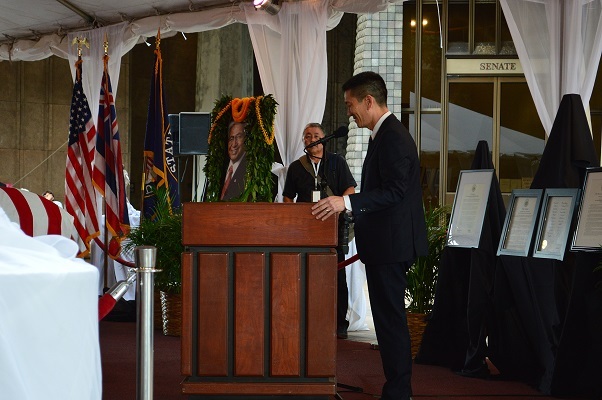 Senator Akaka was a true leader who lived aloha each and every day. Aloha Senator Akaka . . .